The first set of Old American Songs was written in 1950 and premiered by the famous tenor Peter Pears, with Benjamin Britten at the piano. Copland composed a second set in 1952, which was premiered by baritone William Warfield with the composer at the piano. Copland later transcribed both sets for vocal soloist and orchestra. 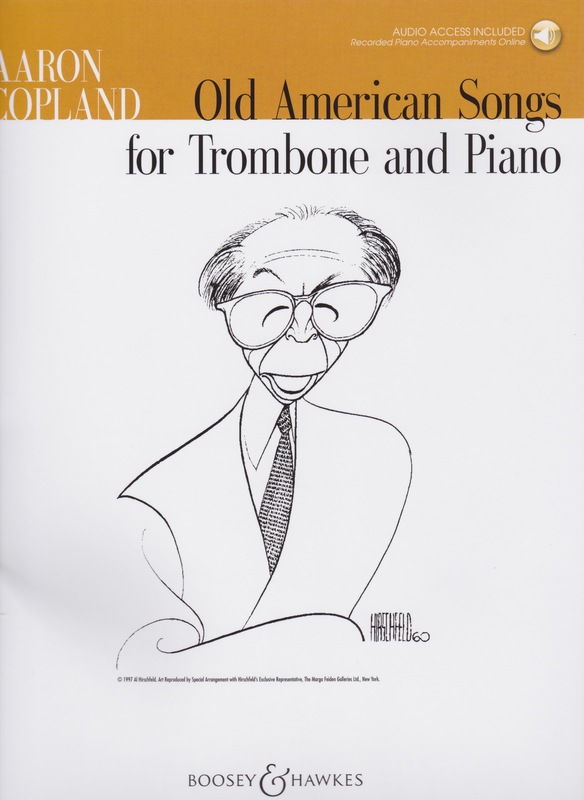 Since then many of the songs have been arranged for a variety of solo instruments with piano accompaniment, including trumpet, cello, flute, clarinet, violin, and horn. The piano parts in this edition are the same as Copland’s originals but often transposed to a suitable key for trombone. The original vocal parts are idiomatically adapted and arranged by Bryan Stanley for trombone. Dr. Stanley is an accomplished pianist-composer who is currently on the faculty of Waldorf College as an Adjunct Professor and collaborative pianist. His previous publications include two arrangements of Copland's Appalachian Spring for violin/piano and solo piano and a Hal Leonard Vocal Library book of American Folksong concert arrangements. As an added bonus there is included a data CD that contains MP3 audio files of the piano accompaniments to make practicing more fun. The data CD also includes all of the piano accompaniment parts for all of the pieces in the collection as printable PDF files. The first set of songs included in this arrangement are: The Boatmen’s Dance, The Dodger, Long Time Ago, Simple Gifts, I Bought Me a Cat. The second set includes: The Little Horses, Zion’s Walls, The Golden Willow Tree, At the River, Ching-a-Ring Chaw. The subject matter for the songs includes politics, religion, children, love and loss, death, and the minstrel stage. These songs are still among Copland’s most frequently performed and best-loved compositions. For the most part, he keeps quite close to both the original melodies and tonal harmonies, thus making these pieces of Americana accessible to all performers and audiences. They are clear manifestations of his compositional period during which he drew inspiration from American subjects and sought to speak to a large segment of the American public in a musical language that is simple and understandable. The arrangements work well for trombone and are technically within the abilities of less advanced players. Some of the songs are appropriate for high school level trombonists or even a good middle school level performer. Younger players can listen to a recording by the superb vocalist Thomas Hampson and learn a great deal about phrasing, style, expression, tone color, rhythmic articulation, etc. These songs are excellent material for professional or degree recitals.